Emerging trend of adopting the cloud ecosystem is expected to continue its prominence into the market and is anticipated to show strong growth in terms of both revenue and deployments. Microsoft’s Office 365 web-based e-mail and scheduling products, customer relationship management offerings by Salesforce.com, App Engine by Google, Red Hat’s OpenShift, Elastic Compute Cloud (EC2) introduced by Amazon Web Services, VMware’s vCloud Air and IBM’s SoftLayer are contributing in the expansion of Global Cloud Computing Market and accelerating its wide adoption and business acceptance. Rising awareness and familiarity with public cloud services are contributing in the expansion of public cloud services market and its worldwide acceptance. For instance, in 2014, General Electric shifted over 90 percent of their applications in a public cloud environment. Leading cloud technology companies are also partnering with government bodies to provide prominent solutions against cyber attacks. For instance, Amazon Web Services (AWS) provides on-demand cloud computing platforms to federal government. In 2016, Amazon Web Services announced to open a data center in Canada as Canadian government believes that will allow easier compliance and protection of Canada’s data privacy law. In 2017, United States Department of Defense announced to form a committee named the Cloud Executive Steering Group to explore cloud computing services potential. Implementation of this program within the organization is estimated to support 1.3 million soldiers and 742,000 civilian employees who work for the government agency. 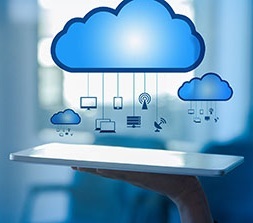 Global cloud computing market is projected to reach USD 408.3 billion in 2024 from USD 105 billion in 2016, growing at a CAGR of 18.5% during the forecast period, owing to the increasing adoption of cloud computing services among small and medium-sized enterprises. In 2016, over USD 80 billion was spent on cloud services by all small and medium-sized enterprises and the spending is expected to increase 4 times by the end of 2024. North America is the dominating region for global cloud computing market in 2016 followed by Europe and is projected to dominate over the forecast period. Presence of leading cloud tech companies in the U.S. companies with high levels of expertise are providing a competitive advantage to the dominance of North America region in cloud computing market. Canada is the one of the major market for U.S. computing services exports. In 2014, U.S. based cloud tech companies exported cloud computing services worth USD 4.4 billion to Canada. North America Cloud Computing Market is projected to reach USD 131.87 billion by 2024 and is anticipated to grow at a CAGR of 16.0% during the forecast period. Asia-Pacific and Latin America are the fastest growing regions for global cloud computing market. Brazil cloud computing market valued around USD 1 billion in 2016, owing to the wide adoption of cloud services for enterprise resource planning or customer relationship management by Brazilian IT companies. Cloud computing technology is becoming a strategic priority in countries such as Australia, China, India, Japan and South Korea are supporting the growth of cloud computing market in Asia-Pacific region. Lack of infrastructure, bandwidth constraints and fiber optic weaknesses majorly in developing economies are obstructing the adoption of cloud services. Moreover, data privacy and security is a delicate matter which is continuously creating challenges for the growth of cloud computing business. Mainly public cloud services which is more vulnerable towards data leakage is creating trust-related issues among users and causing hesitations amongst those who are considering purchasing of cloud services. However, cloud tech companies are collaborating with government and are investing into national security and addressing data security issues for their citizens is likely to overcome this challenge in future. Growing penetration of cloud computing and trend of migrating organizational application to the cloud are the major driving factor for the growth of cloud computing market.